Happy Friday everyone! Hope you can come over to The Lounge and hang out with us... maybe play along with this Friday's sketch. This card is based on one of Lila Holgate's wonderful creations. Today, I used an old set called Garden Thoughts. I wanted to challenge myself and use an image I'd never colored. Orange Sparkly Fluff on the flowers makes them really pop off the card. I used a button from Fancy Pants and covered it with Ranger Distress Paint. The designer paper is also by Fancy Pants, and the cardstock by Bazzill. the main image is stamped on Neenah White and colored with Copic Markers. I added the distressing with Ranger Antique Linen ink. I also want to share with you a new online store! Today is their Grand Opening, and they are offering some really cool specials, including an offer from OCL. 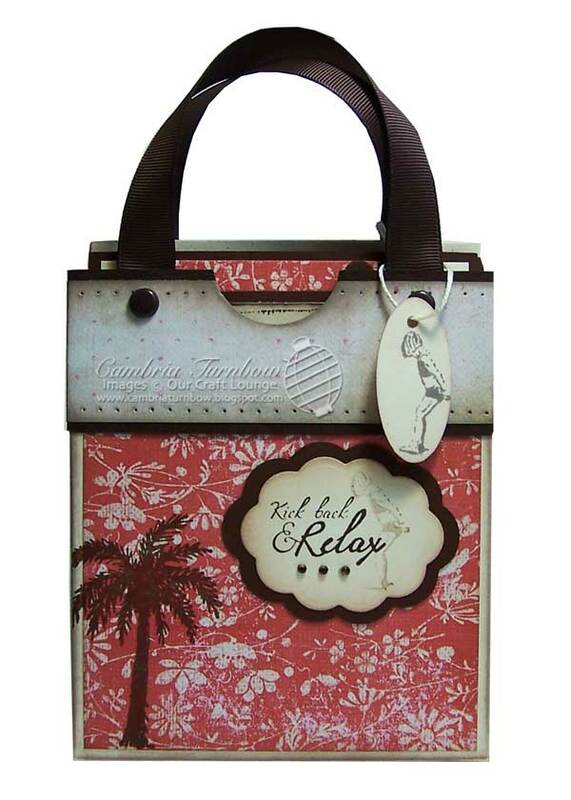 The Inspiration Emporium will be carrying the entire OCL line of products! One stop shopping baby!! Click here to visit the Inspiration Emporium! Here's the three cards included in the tote from the previous post. I used on all three Vanilla Neenah Cardstock, that wonderful designer paper from Fancy Pants called Dainty Flower, some Dark Brown from Bazzill, Ranger Walnut Stain, and Pumis Stone Ink. I used to Copic markers, E00 for the skin and E15 for the hair. I also used some trim from Maya Road and brads from American Crafts. I used two stamp sets from Our Craft Lounge. Sandy Sunsets and Treasured Friend. Hope to see you tomorrow for the OCLDT Sketch! Hello everyone! Summer is officially in full swing at my house. Now, if the sun would come out more, I think it would feel more like summer. Yesterday we took the kids and went to the beach for the day. We are just a few miles from the OR coasty beaches, but we take it for granted since it's always been here for us. It was nice to get out, get some fresh air and appreciate the beauty of where we live. The kids got all sandy and wet and came home wiped out and ready to crash at bedtime. It was a good day. I think that's why I love these two stamp sets so much. They remind me of home. Sandy Sunsets and Treasured Friends. They work nicely with each other too. I made this little gift box that holds three cards and a gift card holder for Averie's teacher. The box is so easy and fun to make. It's a creation made by my brilliant friend Leslie Miller. She has a super tutorial here. You can adjust the measurements to make it any size. I followed her instructions, except for making it a tad taller. I could only fit three cards because of the embellishments I used, plus the gift card holder. The designer paper is from Fancy Pants called Dainty Print. I used Neenah Cream cardstock and a dark brown from Bazzill. The cards all match the box.... I will show them all to you tomorrow. I used Ranger Pumis Stone and my spongie tool to distress all the edges. 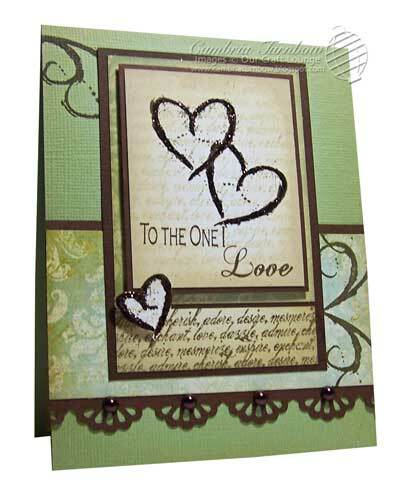 The big brads are from American Crafts and the scallop die from Spellbinders. Today is also my Anniversary, so I made this card for my Man. We've been married for 22 years today! Hard to believe I met him when I was only 17. Four kids later and I love him more than ever. Time flies so fast... I'm looking forward to spending the weekend with him. 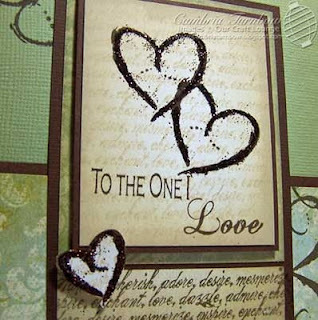 I used the stamp set Love Notes along with designer paper from Fancy Pants called French Press. The cardstock is Bazzill. I used two Distress Ink colors (Antique Linen and Walnut Stain). I must say, I'm getting good with that sponge tool thingie. I LOVE the distressed look. I made the hearts really pop by using my Quickie Glue pen and our Coffee Bean Crafty Sparkles. I added some pearls in the center of my new EK Success Edger punch that I picked up from MOT this week. Hello stampers! How are you? I feel so out of touch with everyone lately... sorry about that. I'm buried in work prepping for Summer CHA and our next release... but I'm sure you'll love what's to come. :) Are you going to Chicago for CHA or the Super Show? 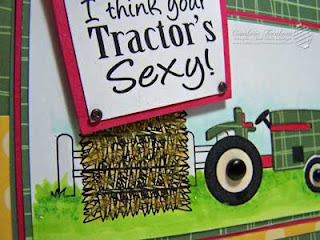 If you do, I hope you'll stop by and see all the OCL girls at CHA. We'll have lots of stamping celebrities hanging out and helping with Make and Takes. I found some time to stamp a little over the weekend. 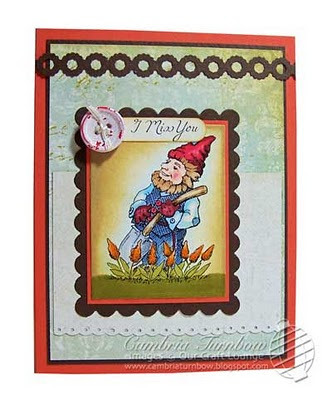 For this card I used three stamp sets, Love Notes, The Journey, and Dandy Days. 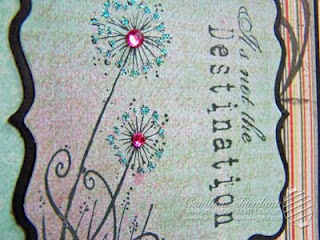 I stamped the script from Love Notes on the designer paper with Ranger Old Paper Ink, then the Dandy Days image and the sentiment with Ranger Soot Black. I then spayed some Bubble Gum Glimmer Mist in the corner. I'm rediscovering how much fun and beautiful using Glimmer Mist is! Oh... and see that cool chain? It's my newest EK Success Edger Punch. Yep... I was shopping again down at MOT. The centers of the dandelions have a jewel from Bazzill, and Crafty Sugar Sparkles applied with a Quickie Glue Pen. 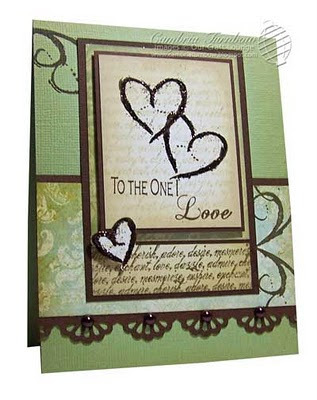 The swirl in the corner is also from the set Love Notes. The designer paper is from Fancy Pants, cardstock from Bazzill. Main image is a die from Quick Kutz. Thanks for stopping by! See you on Friday with another OCLDT Sketch. Wow, this week flew by! Seriously, just FLEW by! Today is Friday though... it really is! That means it's time for another OCL Design Team Sketch Challenge. This awesome sketch is based on a card by Michelle Fowler. 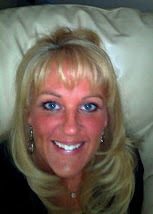 LOVE her work... have you seen her blog? Click on her name, check it out. I promise it's a treat. Click here, to head over to The Lounge and get all the details about our sketch challenge and play along if you can! I love seeing what everyone makes! Can you see the Sparkly Fluff? Appletini for the grass and 24K Gold on the Hay. Those little tiny screw brads are from Tim Holtz, and the bigger brads on the wheels are from 7 Gypsies. 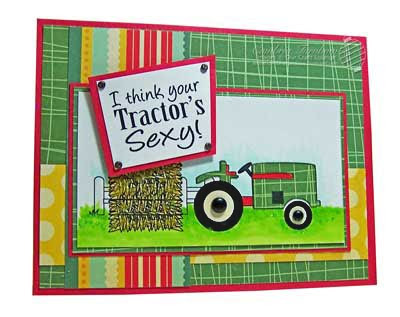 The Tractor is paper pieced with designer paper from Cosmo Cricket. I used two stamp sets, The Barnyard and Barnyard Banter. Have a wonderful weekend! Thanks for stopping by!